When was the last time you had a boiled steak? Probably never- well, hopefully never. There’s a good reason too! It just wouldn’t taste good. A ton of the characteristic flavor from a steak comes from the caramelization, or browning, that comes from cooking over high, dry heat. 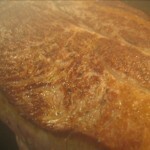 Caramelization, that results in that luscious brown color, is the oxidation of sugars in the meat by applying high heat. This is the same process that causes other foods to turn brown by applying heat, such as cooking table sugar into caramel. While meat doesn’t have a lot of sugar, it has more than enough to caramelize. Start with a dry piece of meat. Nothing ruins the potential for caramelization like water. Use a paper towel to make sure anything you want to brown is as dry as possible. Use high heat. Whether you’re using a skillet, broiler or grill, you want the heat up high. Preheat your pan or grill and make sure it’s hot before putting the meat in. 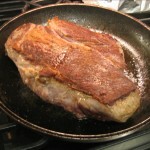 Then, keep the heat high enough so any moisture that comes out of the meat evaporates immediately. If the heat is too low, moisture will collect in the pan and you’ll end up steaming. Use a heavy skillet. The heavier the better. This helps the pan keep its heat when you drop in the meat. Cast iron or heavy stainless steel is a good choice. Bring the meat to room temperature. This will keep the pan from cooling down too much when you first put in the meat. Don’t leave it sit out all day- just let it warm up a bit. Balance the heat and time. You’ll also need to adjust the heat based on the total cooking time. Balance the heat and time so that the meat has the perfect amount of caramelization when it’s just done inside. One easy way to do this is to start something in a pan or on the grill on high heat and then finish it in the oven (maybe 350F). More surface area. The larger the surface area, the more room there is for caramelization. Butterflying cuts like chicken breasts or pork loin creates a larger area to brown. 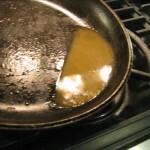 In the case of chicken, this also creates a flatter surface so browns more completely in a skillet. Add some sugar. 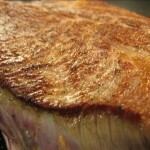 A little sugar added to your rub or brine will promote better caramelization. 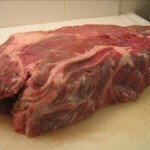 Rubs can go on meat just before cooking, while brines typically take 1-3 days to do their job. Heck, do both! 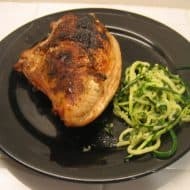 You can apply these techniques to anything that benefits from caramelization. Now that you know those secrets, I’m going to leave you with two tips and one recipe. 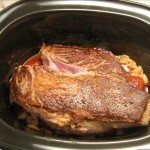 The second tip is to NEVER put meat into the crock pot without first browning. This can make the difference between something blah and something really spectacular. It’s definitely worth the effort. Use the first four caramelization tips above to get that roast good and brown. Don’t even think about skipping this step!!! While that’s going on, put the rest of the ingredients into the crock pot and set it to low for 8-10 hours or high for 4-6 hours. Put in the very brown meat, put on the lid and go kill a few hours. I also deglazed the skilled used to brown the roast with about a cup of water and added it to the crock pot. When it’s done, skim off any excess fat and season with salt and pepper before serving. The end result will have a very thin and light sauce. You can thicken this up with some flour mixed with milk or water and then bringing to a simmer for a minute or two. Another nice addition to this would be any root vegetables like carrots, parsnips, rutabegas, etc… Celery and/or leeks would also be nice. Fresh chopped parsley added in just before serving would be wonderful. This is also a great opportunity to clean out anything getting old in the fridge. If you have a good variation to this or decide to make this recipe, post a comment! meats do not caramelize they go through the malliard reaction.